So far Peta Stephen has created 156 blog entries. Hello and welcome to my blog. Happy Easter everyone , I hope you’ve had a lovely four day long weekend and spent some quality time with your family and loved ones. I’m back this week CASEing the Catty. 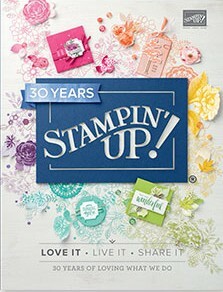 Last week I was in Auckland attending Stampin’ Up! On Stage. I had the best 5 days away, met some amazingly talented ladies and got to see a sneak peak of some products from the new Annual Catalogue. You’re going to love the new Catty when you get your paws on it. This week at CASEing the Catty we are CASEing Easter. You can CASE an Easter card from either Catty or CASE any project and give it an Easter twist. You may have arrived here from Siobhan gorgeous creation, thanks for continuing on with me. Make sure you visit all the Design Team’s Blogs by clicking on the “next” button at the bottom of each post. I’ve used the cute little Easter basket on page 31 of the Occasions Catalogue as my inspiration this week. I’ve made a card using the rabbit from the Fable Friends stamp set. My card base is Balmy Blue with a layer of Whisper White and Tranquil Textures DSP. I think the pattern on the DSP looks a little bit like Easter Eggs. I’ve stamped the rabbit in Memento Black Ink and coloured him with Stampin’ Blends. He’s been die cut with the Rectangle Stitched Framelits. If you look closely at the rabbit’s jacket you’ll see it’s from the same DSP as the background. I just stamped on the DSP then fussy cut it. The ribbon is from the Sale-a-bration Catalogue and the sentiment is from the Itty Bitty Greetings stamp set. Marvi was keen to get back to posing for photos. Apparently he was very naughty while I was away…….let’s just leave it at that. Next up tonight is Rebecca’s beautiful project. I had the pleasure of catching up with Rebecca in Auckland and we shared stories and pictures of our cats lol. Just click on the “Next” button to hop right over. Hello and welcome to my blog. Sunday night has rolled around again so it’s time for CASEing the Catty Blog Hop. It’s been a busy weekend with last minute shopping and organising friends and family to look after Marvi. I’ve almost finished packing for On Stage in Auckland. I’m leaving on Tuesday and I can’t wait. This week at CASEing the Catty we are CASEing from the Classic Garage section of the Occasions Catalogue, pages 42-55. You may have arrived here from Rose’s gorgeous creation, thanks for continuing on with me. Make sure you visit all the Design Team’s Blogs by clicking on the “next” button at the bottom of each post. I love everything in this suite of products but I’ve decided to CASE the “for you” card on page 45 and use All My Love DSP. It’s a fairly simple card layout so I’ve kept my layout very similar but changed up the colours. I’ve just received the Crackle Background stamp and I was itching to ink it up. I’ve stamped it in Crumb Cake ink over Crumb Cake card stock. There’s a layer of Lovely Lipstick behind the DSP and I’ve also used the Lovely Lipstick ribbon from the All My Love Ribbon Combo Pack. I’ve stamped the flowers from Forever Lovely and embossed them with Copper Embossing Powder then adhered the matching die cut over the top of the flowers. It’s hard to capture the shine of the Copper Embossing. The sentiment is from Eastern Beauty and it’s also Copper Embossed. There’s some Copper Trim and Copper leaves behind the sentiment. Next up tonight is Elizabeth’s beautiful project. Just click on the “Next” button to hop right over. Hello and welcome to my blog. 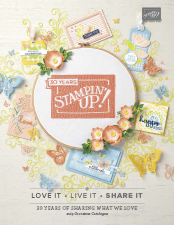 Today is the last day of Sale-a-bration 2019 so we’re doing one last Sale-a-bration Blog Hop before these free products are gone for good. If you like something you see on tonight’s hop there’s still time to put in an order. You’ve got until 11.50pm (aet) tonight which is 10.50pm here in Queensland. You may have arrived here from Michelle’s gorgeous creation, thanks for continuing on with me. Make sure you visit all the Design Team’s Blogs by clicking on the “next” button at the bottom of each post. I’ve chosen to CASE cards that use one of my favourite SAB products, Butterfly Elements. I’ve combined inspiration from the 2 cards on the right hand side. I’ve made 2 cards, one in Night of Navy and the other in Berry Burst. My layer of Whisper White card stock has been embossed with the Subtle Embossing folder then punched with the Butterfly Duet Punch. I’ve layered some Needlepoint Nook DSP behind the butterfly cut outs then added a couple of Butterfly Element. Did you know that these Butterfly Elements are the same size as the punch? SU are so clever with their co-ordination. I’ve decorated the inside of these cards with a writing panel and a thin strip of leftover DSP. Marvi has been a bit quiet lately. I’ve been teaching him to walk with a harness and lead and he’s been too grumpy and tired to pose for photos. He’s hilarious to watch because he keeps falling over like he’s drunk. He desperately wants to go out in the front yard and explore the bushland opposite but the only way he’s getting out there is on a lead. We get some strange looks from the people driving by. Next up tonight is Judy’s beautiful project. Just click on the “Next” button to hop right over.